When I placed my order for the iPad 2, I don’t know whether I was more excited for the device itself, or the Smart Cover that I ordered along with it. Apple’s introductory video for the Smart Cover was positively drool-worthy. After nearly two months with my iPad 2 and its Smart Cover, though, I’m less convinced of the Smart Cover’s awesomeness. I still like my Smart Cover, but I definitely don’t love it. Watching Apple’s promotional video again now, I like almost everything that the company showcases in the ad. The cover itself looks cool—I went with the green on a whim, but I’d really be content with any of the colors Apple sells. I like the viewing angle the Smart Cover can fold up to create, and I really like the strong angle it offers for typing. (I tried a variety of cases for the original iPad; none came close to matching the swell angle the Apple iPad Case provided.) The Smart Cover latches on easily, and with a satisfying click. And the clever way the cover wakes up your iPad when you open it, and puts it back to sleep when you close it? That’s brilliant. I will say, however, that I can rarely fold the Smart Cover into that typing/watching triangle as delicately as the hand model in the video. Folding the Smart Cover into position isn’t difficult, but I find it just a bit clumsier a process than I had anticipated. But my chief complaints with the Smart Cover relate to elements of its use that Apple doesn’t cover in the promotional video at all. 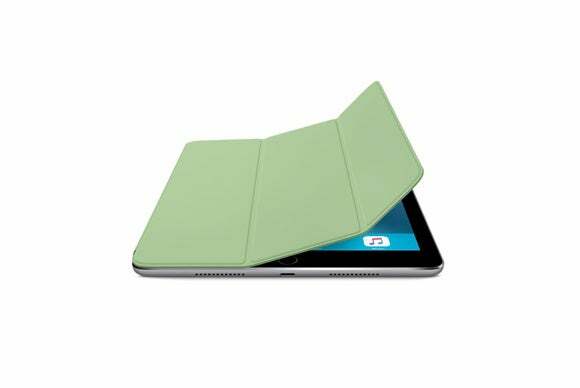 My biggest grievance is that there’s just no perfect way to fold back the Smart Cover when you actually want to use your iPad in hand. The video shows iPads waking up, going to sleep, and being used on a tabletop. What about when I want to hold the dang thing? Initially, my thought was to flip the Smart Cover around the back of the iPad, just as you might do when reading a magazine. Since I’m right handed, I generally hold my iPad in my left hand so that I can tap with my right. And because there are no magnets to keep the Smart Cover latched on when you swing it around to the back of the iPad, it doesn’t stick there—it just flops down at various annoying angles. I tried switching to holding the iPad in my right hand so that I could grip the Smart Cover to keep it in position, but I really prefer letting my right hand drive when working one-handed. Macworld senior contributor Andy Ihnatko endorses an accordion fold; he likes the extra thickness that approach affords. But I find that if I put the iPad down, the accordion quickly unfolds itself. I tend to end up folding the Smart Cover roughly in half behind the iPad, so that it sticks magnetically to itself with the microfiber side facing in. The approach works, but it still feels silly that the folded flaps flop down if you let go, instead of sticking somewhere. My father takes his Smart Cover off completely every time he uses his iPad 2. Maybe he has the right idea. But my complaints go beyond what the heck you do with your Smart Cover when you actually want to use your iPad. I think the screen-facing microfiber is a clever idea, since it can clean off your iPad’s accumulated fingerprints and other grime. But because of the cover’s folds, the microfiber can’t make direct contact with your screen. That leaves your screen looking pretty clean, save for three vertical streaks that the cover never touches. It’s not a big deal, but if this accessory wants to earn its “Smart” moniker, the cover should have been designed with some ingenious way to keep all the microfiber flush. Because it doesn’t, I end up smushing my Smart Cover around a few inches in all directions when I want to clean the screen, the magnet latching and unlatching as I do. That process feels a bit dopey. 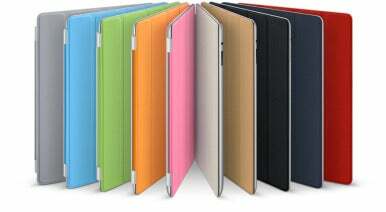 The slim yet sturdy Smart Cover protects your iPad screen without covering up its durable aluminum back. So your iPad still looks and feels like an iPad — just with a little extra protection. I don’t know how “durable” the back of my iPad really is, but I know I get a smidgen nervous when I toss my Smart Cover-clad iPad into my bag. The clunkier Apple iPad Case wasn’t nearly as cool—or easy to put on and remove—as the Smart Cover, but it definitely made me feel like my iPad was better protected on all sides. The naked iPad 2 looks slick. I like that the Smart Cover only enhances the iPad’s coolness factor, and I haven’t yet encountered a case that’s lightweight, thin, and magnet-enhanced that would protect the iPad any better without some of the Smart Cover’s annoyances. It may well be that the Smart Cover is the best we can hope for—and as I said at the outset, I think it really is pretty good. I just wish it were great.